Welcome to the second post in our “Getting Ready For Resolutions” series. 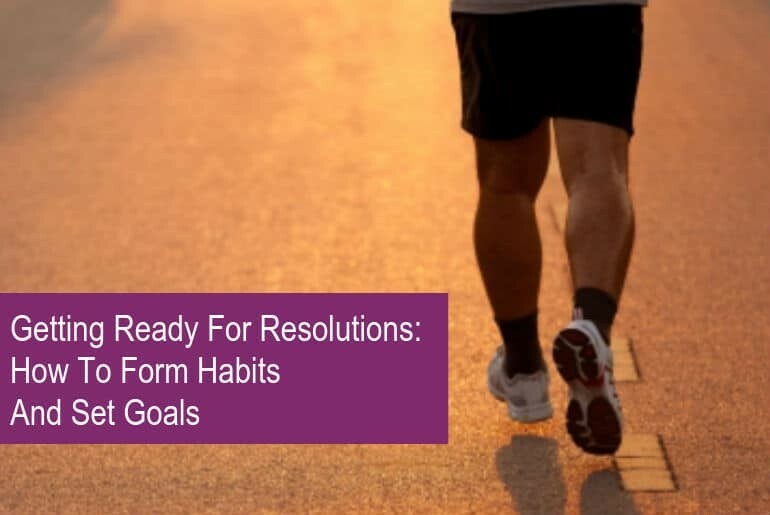 In this series we’ll be taking a look at how we can keep our resolutions by picking the right ones for us, motivating ourselves properly and forming habits so that we maintain our resolutions and can keep our habits going without even thinking about them. If you missed the first post in this series then check out the first post in this series “A Brief History Of New Year’s Resolutions“. In this post we’ll look at what habit are, why goals are important and how you can pick habits that you’ll maintain. So essentially when we form a habit we’ll need to ensure we’re happy for it to be a regular thing that we’re not going to give up on too easily. There’s a saying that we’re all creatures of habit and I’m sure if you sit down and think about it there are a lot of things that you do in your daily life that are habits buried so deep in your subconscious you don’t even think about them any more. Have a coffee at 11am every day? Always check social media first thing in the morning before you go to work? Get up and/or go to bed at the same time every day? Eat a certain meal on a certain day? If you answered “Yes” to any of the above then you’ve formed regular habits and you didn’t even realise it! These regular routines are your subconscious habits. You can form habits (good or bad) by sticking to your routine long enough that it becomes second nature. Trigger: Something that sets the habit in motion like getting up, it’s Wednesday etc. Traction: Something that makes the habit stick as part of your daily routine. In order to form a habit you need to have an end goal in mind. You’re far more likely to achieve and stick to a new routine if you know what you’re working towards, and how you’re going to get there. The above goals are great – really worthwhile and quite common ones that people have. The problem with the ways that these goals and habits are set out is that they’re too vague and aren’t defined at all. Because of this they’re going to be difficult to achieve and you’ll have a problem motivating yourself or measuring your success. If you can’t physically or mentally do something to work towards your goal it’s destined to fail as you’ll never be able to achieve it – or know that you’re working towards it in the right way. If your goal doesn’t fit in with the 3 A’s then you won’t be successful in forming your habit. When choosing your goals they need to be something that you’re happy doing otherwise there’s no real point in attempting them. Of course, when you’re working on your goals you don’t need to be able to achieve 100% of the goal to start with – after all you’re working towards achieving it. For example, if your goal is to “Exercise more” you wouldn’t be expecting to run a marathon on the first day of training! Making your goals achievable ensures that you’ll be able to form a habit and motivate yourself to achieve more and more each time you action the habit. This progress as you move through the weeks is a great motivator. Starting out with a smaller goal helps you to achieve it and expand on it. What’s the point of working really hard if there’s no reward in it for you? This may seem a little self-serving but you don’t get “something for nothing” as the saying goes! Rewards don’t have to be tangible, they can be more psychological and emotional too. For example using the “Exercise more” habit as an example, the reward may be a new pair of trainers or an iPod when you start running 5km or the reward may be more emotional like simply feeling better about yourselves, or physical like ultimately being able to run the London Marathon. When it comes to “Trophies” you should reward yourself little and often with a larger trophy when you reach a major milestone. This will help you maintain your habit as you’re seeing the benefits regularly with a larger “prize” to look forward to. You’ll need to choose your rewards carefully. They’ll need to be something that you can provide or desire. There’s no point promising yourself a new iPod if you haven’t got the funds to buy it, or promising yourself a day off when you’ve run out of holiday days. Pick something that you have access to and will assist in your motivation to achieve the goal. Don’t Set A Time Limit Some habit forming strategy systems state that you only need 21 days to form a habit. In fact a 2009 study showed that habits can take from 18 to over 250 days to form. There’s no way that you can put a set time limit on a habit, there are so many factors that can change how long it takes to achieve it and you don’t want to say “I’ll give up now” just because you’re on day 22 and the habit hasn’t completely stuck. Get Some Help: Part of forming habits is being accountable to yourself. Being accountable to other people as well is also a great motivating factor. Ask a friend to keep you in check or use an app like Coach.me (read my review of Coach.me here) to track your progress and check in with like-minded people. Track Your Progress: As mentioned above apps like Coach.me allow you to track how you’re getting on. You can also use a diary, notebook or specialised planner to track your progress. Top Tip! Sign up to my newsletter to get free access to diary, planner and resolution tracker downloads. Tracking your progress is a great way to motivate yourself and allows you to measure if you’re doing enough (or even too much) to achieve your goals. Don’t Fear Failure: If you miss a day, don’t feel up to something one day or don’t quite achieve a goal then don’t worry! Don’t use this small set-back as an excuse to give up altogether you just need to re-evaluate your goals to see whether they’re achievable as they are and if not, change the schedule or means of measurement. Maybe your “trophies” aren’t rewarding enough for what you’re trying to achieve so perhaps you need to change these to reflect your motivating factors. Start One Habit At A Time: It may be tempting to start lots of new habits on January 1st buy you’re setting yourself up for failure. Pick one habit you find easiest (or most important) and work on that first. Spreading yourself too thin is no good for habit-forming or your mental and physical well-being – you’ll just end up burning yourself out. The only exception with starting more than one habit at a time is if they can be chained as explained in the next point. Chain Habits Together: If the habit you’re doing fits in with another then tie them together. An often used example is that you may want to start the habit of flossing every day. You can easily tie this habit in with your existing habit of brushing your teeth. Your morning teeth brushing routine is the trigger to action the new habit of flossing. Another example would be if you wanted to check your social media in the morning before work. If you have a cup of coffee every morning, chain in the new habit of checking twitter with your coffee. Above All Else Have Fun: Forming a new habit is stressful enough as it is without the added pain of not enjoying it or at least having a really worthwhile cause. If you’re not enjoying a habit then you’ll end up giving up on it, conversely if you have a good enough reason or enough fun then you’ll be more likely to keep the habit up. Do you have trouble forming new habits or is it really easy for you? When you form a new habit how long does it take? Do you track your goals? If you do, how? Let us know in the comments or hit me up on Twitter or Contact Me. And don’t forget to subscribe to my newsletter to get free access to my diary, planners and resolutions tracker resources.